Rubenerd: iPhone and Zune, no comparison! iPhone and Zune, no comparison! Probably the last thing you want to read is another Apple iPhone analysis, but I see something quite big happening here. Microsoft is already struggling with getting the Zune name as unbiquodous as iPod. They've been going around to different university campuses in the United States, they've been shamelessly astroturfing to give the illusion they have more support than they actually have, and still the vast majoraty of people still don't even know what the Zune is or have even heard of it before. Now you can't readily compare the new Apple iPhone to the Zune, they're two different devices aimed at capturing two different markets, but they're both an example of where Apple and Microsoft are going. It's no secret to anyone that the Zune is ugly. People on television are saying so, newspapers are writing about it, bloggers are, and even though it was a brand new device the older iPod still outsold it by leaps and bounds during the 2006 holiday season. 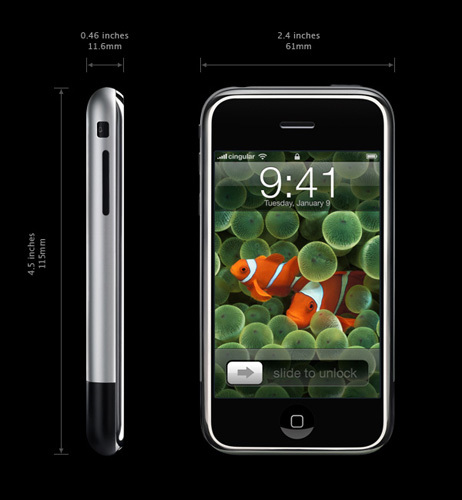 In comparison, the very first iPhone just looks swish. In reality the iPhone shares very little with the iPod line, they run a differrent operating system and preliminary reports suggest they run on vastly different hardware as well, so in reality Apple have laregly created a version 1.0 device as well. So Microsoft and Apple seem to be going in opposide directions: Apple had a music player, now they have a phone/PDA. Microsoft have provided PDA software for years, now they have a dedicated music player. The difference? Apple makes devices people want! I haven't heard anyone here in Asia who have returned from holidaying in the US saying anything good about the Zune. Asian girls in particular seem horrified by the design and readily tell me they wouldn't put those things anywhere near their handbags! The iPhone on the other hand? I don't think I need to explain the response ;). I think this whole saga exposes the difference between Apple and Microsoft. From what I can tell Microsoft seems to be a company thesedays based on reaction rather than innovation; Apple shamelessly copies from others as well (Konfabulator anyone?) but the result is much more well executed. I'm dissapointed over the lack of Java support in the iPhone though. Am I biased? Probably. But I think Microsoft should just stop making copies of handheld consumer products and just focus on Windows and Office. I know my dad who is forced by Shell to use both daily would just appreciate improvements in stability and speed rather than the useless "features" Vista is stocked with or silly office ribbons. Last time I checked he's still running Windows 2000 Professional with Office 97 Standard.